Finance Minister Sinckler: How much money did the DLP receive from CLICO? It was no surprise when Minister of Finance Chris Sinckler refused yesterday to talk to The Nation reporters about the leaked CLICO auditors report. That’s fair: I wouldn’t expect him to answer two ambushing reporters about something he just read in the paper. The strange part is that the reporters didn’t then hand him a copy of the leaked report so they could come back later. But maybe it’s not so strange that Bajan journalists always keep their questions deferentially weak. As we’ve seen time and time again it’s not healthy for a journalist’s career to be too aggressive (or should we say “professionally curious”). 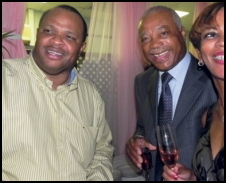 Here’s a question that is very relevant considering that the DLP and the BLP before them allowed CLICO and Leroy Parris to get away with murder of the financial standards… How much of policy-holders’ monies did CLICO donate to the DLP and the BLP? At this point our finance minister undoubtedly knows the answer to that question: but the gutless Bajan news media won’t ask it. Minister Sinckler: How much money did CLICO give to the DLP over the last 10 years? How much did your personal campaign receive?